The popular children’s sleeping bag Dream Express is available not just in bright apple green, but also in a beautiful shade of blue for little adventurers. This great sleeping bag makes it easy and fun to spend a night away with friends, stay in cottage accommodation or go camping! 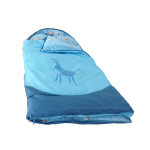 Highlights of the blue sleeping bag include the fun, printed lining, the soft filling and the great giraffe print on the front. 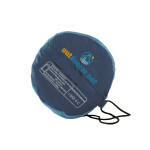 As a true Outdoorer sleeping bag, the Dream Express doesn’t just keep your child warm, but is also easy to clean. You can order the great children’s sleeping bag Dream Express at our Amazon store. 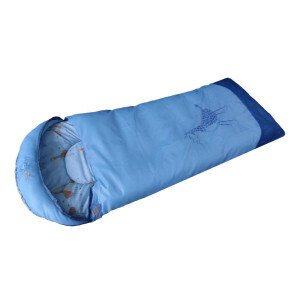 Children feel much more comfortable in a special children’s sleeping bag because it is cut shorter and narrower. The Dream Express by Outdoorer is 130 cm long with a 30 cm head piece with a thermal collar. It is therefore suitable for children with a height of between 110 and 150 cm. It is very important that a sleeping bag for children has a pleasant food because your child should feel safe in it. We therefore use soft technical cotton for the lining. As a highlight, the lining is printed with a funny giraffe family. There is also a giraffe on the front of the cover. The children’s sleeping bag is filled with hollow fibre. This stores heat over a very long period. The hollow fibre filling stores heat very well, so your child can use the Dream Express children’s sleeping bag from spring until autumn. On warm summer nights, the sleeping bag’s zip can be fully opened so you can use it as a blanket. This function isn’t just useful in summer, it’s also handy for sleepovers at friends, your child can take the Dream Express as a spare blanket. To lengthen the useful working life of your sleeping bag (and give you maximum value for money) the Dream Express comes with a very sturdy zip. This makes it easy for your child to open it even with frequent use. It is secured at the top with Velcro. 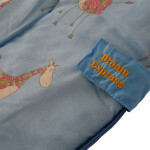 Where to buy the Dream Express children’s sleeping bag? The Dream Express children’s sleeping bag is available at Amazon.